A slice of Wednesday's hearing schedule from the General Assembly web wage. 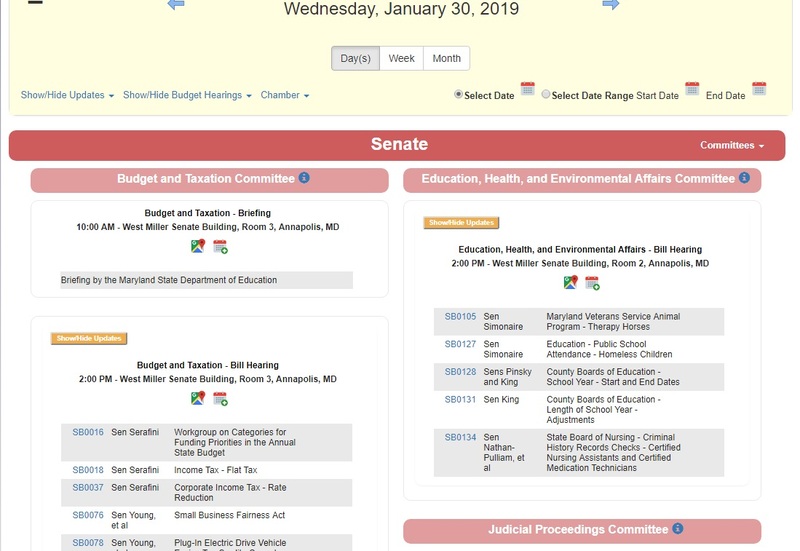 The Maryland General Assembly tech folks thought they had spiffed up the hearing schedule on the legislative website for this session, but instead they got an earful of grievances and questions from lobbyists at a training session Monday. Recent changes to the site were aimed at making the hearing schedule simpler and more user friendly, the Information Systems folks said. But lobbyists who spoke out at the meeting complained the new format makes it harder for them to do their jobs. They liked the previous bland text-driven listing, and its weekly updates. Unlike in prior sessions, when schedule changes were made at a set time each week, the new online listing of hearings and committee meetings is constantly being refreshed. “It’s always up to date,” said Information Systems Director Michael Gaudiello. That may seem like a welcome advance, but lobbyists, who must track scores of the thousands of bills introduced each year, said the change doesn’t give them enough advance notice to react. “We need dependability and reliability. The staffs and lobbyists can’t spend the entire day looking at your screens,” said Bruce Bereano, one of the state’s top-grossing lobbyists with dozens of clients. “This system was developed without any input from the users … It’s not working,” Bereano charged. Those who spoke out wanted to know if they could be notified of changes made in the hearing schedule, rather than having to search for updates online. Others raised problems in printing information that’s posted on the web site. John Stierhoff, a top-grossing lobbyist with the Venable law firm, said printed text is too small to read or the bill numbers are lopped off. “It’s a huge, huge problem,” he said. Julia Worcester, expressed frustration that the meeting was held three weeks into the legislative session. She is president of the Maryland Government Relations Association, an organization of lobbyists, and senior legislative consultant for the law office of J. William Pitcher. “This forum today should have occurred in October to make changes prior to the session,” she said. Gaudiello said printed hearing schedules for the week are available on Mondays at 10 a.m. at the Department of Legislative Services on State Circle and at their information desk in the State House. Updates to the schedule can be found by clicking a yellow bar on the web site. He was reluctant to promise any revisions to the web site’s format as a result of the feedback, with the legislative session heating up. Any changes or notices of future forums will be posted on the Public Notice section of the home page, at http://mgaleg.maryland.gov/. Information Systems supports about 1,200 personal computers in the Annapolis complex and operates a legislative data center as the primary technology support group for DLS and the Maryland General Assembly, according to their web site.